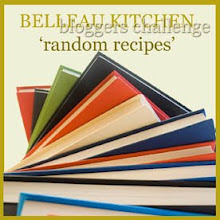 I am so pleased that I found the time to take part in Random Recipes this month. I love homemade bread and although I don't have a problem making it, somehow I don't get round to doing it very often, but as Dom at Belleau Kitchen has challenged us to a Random bread making challenge, it was the perfect opporutunity to try something different. 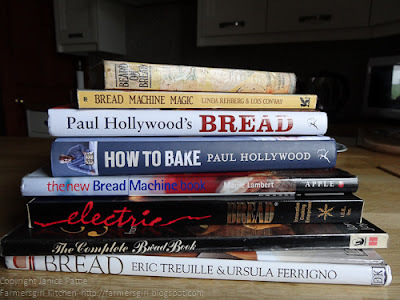 First take your Bread books, there were eight, then choose one at Random. It's the 5th of May (might not be by the time this is posted but that is the day of the 'Random choosing') so pick number 5. Put all the ingredients into the bread pan of your machine in the order suggested by your machine I structions. Set for white bread, medium crust. Press start. Note: as long as you keep the salt and yeast separate when you add them to the pan I find the order doesn't matter. No bread machine? Just use any handmade white bread recipe, BBC Food have an easy white bread recipe by Paul Hollywood which explains the techniques. I was really impressed with the even texture of this bread, the dill and onion had spread through the dough beautifully and it had baked to a golden crust. 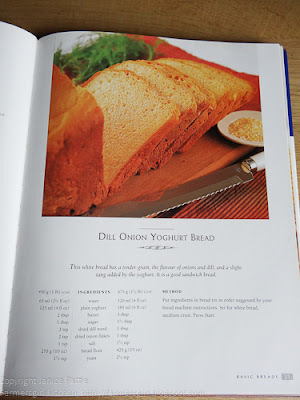 The recipes suggests that the loaf is good for sandwiches and I can see why. It is lovely and soft and the savoury taste of herb and onion would add to the flavour of the filling. When I had tea at The Dorchester (highly recommended) one of the sandwiches was chicken served on basil bread and it was divine. I may try making some of that myself using this recipe. 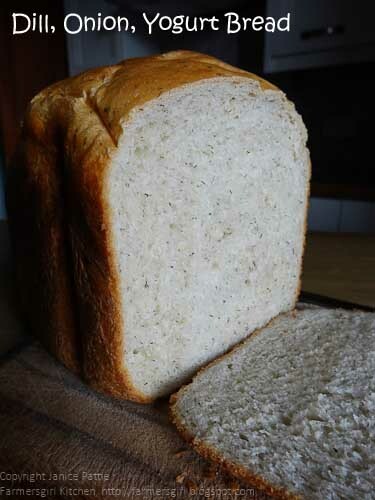 The loaf is very tasty indeed and the herb and onion is not overpowering. I'm looking forward to having some tomorrow with the leek and potato soup I made. 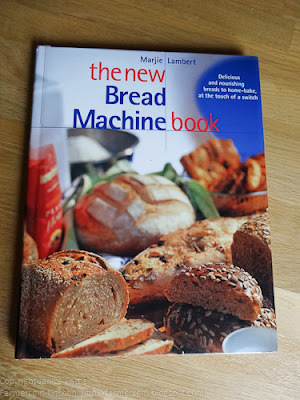 Labels: Bread, Dill, onion, Random Recipes, the new Bread Machine book, yogurt. 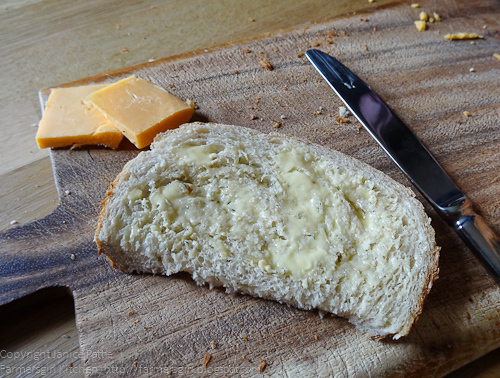 That bread looks really great. Dill and onions in it sounds also good to me. Thanks Chris, it was even better on the second day! Thanks Dom, I was pleased with the lift and the texture. Even for a bread machine loaf it was incredible, I think the yogurt may have helped. A lovely looking (and sounding) loaf. I love onion in bread but I've never thought of combining it with dill. Sounds delicious! What a lovely looking loaf - really tall and impressive. I do find that using yogurt or buttermilk in bread really adds to the flavour and texture and this certainly looks successful! 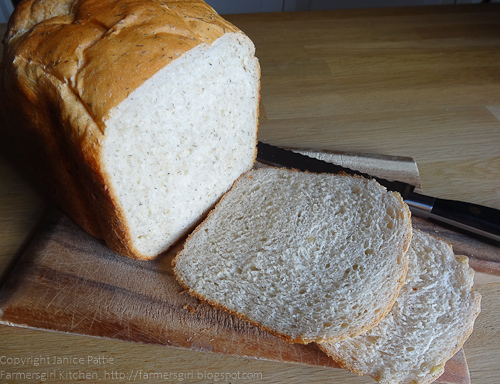 What a delicious bread - I'd love a slice (or two!). The texture looks so pillow-soft! Impressive looking loaf, Janice. I would love a cheese sandwich made with that. What a great looking "tall blonde". It looks perfect. How clever you are and what great ingredients. Must give this one a try myself.